For any architect, scale and proportion are two skills that appear to be the most challenging to master. Scale and proportion are also where a good architect makes their living. I know coming out of school, the thing I was the most terrified about was screwing up the scale of whatever it was I was working on. I can remember losing sleep as I fretted over the size of the pipe columns in the first project I ever designed by myself in the real world (read: The Best Project Ever Designed That Wasn’t). It might not seem like a big deal to others, but I spent a lot of nights worried that my 2″ pipe column was visually too thick for the door it was holding up. The struggle is real as far and scale and proportion go. These days, I’d like to think that I’ve got this scale and proportion figured out and I don’t worry that I’ve made some terrible mistake. More times than not, I can just look at something I’ve drawn and I’d know if something was off. A good case in point is the gable vent I recently designed for a house in Dallas that I am currently working on. This vent isn’t required for performance reasons, I needed it to help break down the scale of the brick gable elevation at the garage and the Master Bedroom wing. This particular garage has an automobile lift in it (stacks one car on top of another) and as a result, the ceiling is rather tall. This created a facade that was quite a bit more exaggerated than originally planned and this enlarged scale was going to require some additional focus and attention. This was one of the initial design sketches I did for this gable elevation design study. I debated showing it here today, but it fits in with the theme of today’s post. The garage door was increased from a traditional 8′-0″ tall door to a 10′-0″ tall door – again to help visually reduce the amount of brick that’s in the gable end of this elevation. 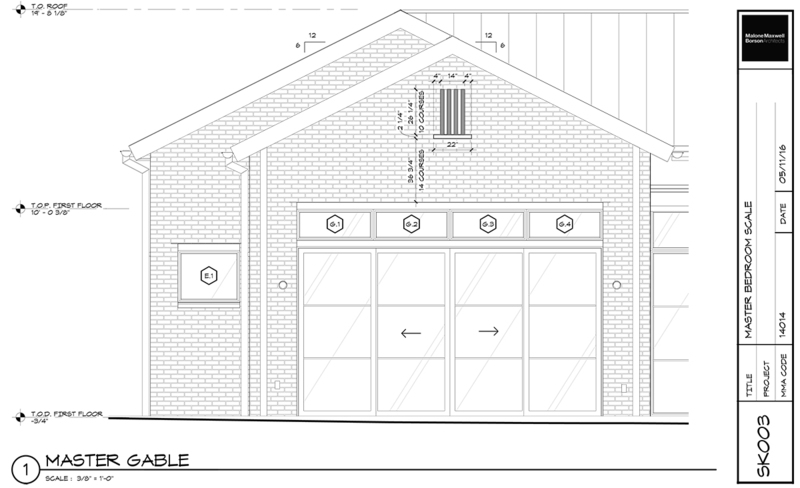 My sketch above is weirdly off because I drew in 4 garage door panels (on an 8′-0″ door, there are typically 4 equal sized panels). That scale figure I drew is exactly 5′-8″ tall and looks crazy wrong. This is the same sketch, I just took out the 4 lines and divided it up into a 5-panel garage door. As a result, my scale figure now appears to be appropriately sized. Whew – Thanks, Photoshop! The other item I added to this gable end elevation is the limestone gable vent (which was actually the reason I created these sketches in the first place.) Generally speaking, I am not a fan of unnecessary ornamentation but I’ve convinced myself that these vents are not unnecessary. I still needed to break up the brick massing and knew that I needed to add something in this end wall to provide some visual relief and provide some scale. I literally woke up in the middle of the night and thought … C.F.A. Voysey!! 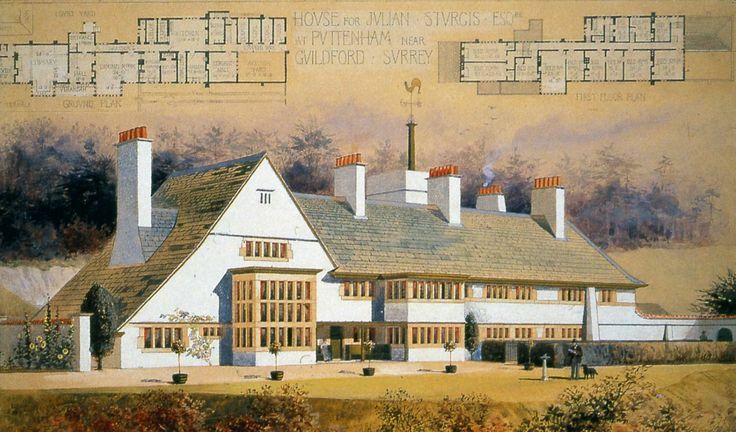 CFA Voysey was a 19th Century English Architect, furniture, and textile designer, and designed some rather remarkable country houses. He is one of my favorite architects but I’m not going to go into that today. What I will acknowledge is that the stone gable vent I designed for this house is an inverted homage to similar type vents done by CFA Voysey. That Architectural History class is still paying off. The sketch above has a similar condition. This is the back side elevation at the Master Bedroom. I must have sketched the vent for this elevation a dozen times … How many brick courses high? How many vertical limestone pieces should there be? How wide should the limestone be? How far should the bottom sill piece extend beyond the verticals? How big should the gaps between the limestone be?? The image above was the very first version … and it wasn’t right. Eventually, I landed on this – three vertical legs … the height of each vent varies slightly between the two gable ends because the amount of brick massing is different. Once we had figured out the scale and proportion, it was a fairly simple matter of drawing up the pattern and sending it off to the contractor. I will admit that I have never done a vent like this before and I spent some time trying to determine what would be placed behind the vertical limestone members. Initially, I thought that I would use the G90 metal that is being used judiciously in other areas of the project because I thought I wanted the recesses to fade to a darker color. Ultimately, I couldn’t handle the idea that I was faking out my real out and decided to recess the tan colored brick and simply place the limestone within the void it would create. I’m kind of wondering if this gives me a pass on the whole “real vent” conversation. It doesn’t look like a vent anymore because you can see the brick in the rear – it’s just a design element to provide scale. The not-a-real-vent was installed on the garage elevation at the end of last week, and once the masons starting pulling down the scaffolding I was able to get a good look at the scale and proportion that I had labored over. I’m going to go ahead and say that I nailed it. Part of the reason I think I got this right is because it doesn’t actually look out of scale and, unless you start counting bricks, you would never know that this not-a-real-vent is almost 32″ tall. (For those of you who have entered my playhouse design competition in the past, you’ll know that this is the size of an 18-month-old baby. Yes, I also have a thing about getting the height of your scale figures correct – because I am a lunatic). One of the most important skill sets a designer can have is their ability to visualize space and the things that occupy that space. This means having a good feeling when something is – or isn’t as is frequently the case – the right size. I’m not sure that this is a skill you can learn; it just seems to be something you either get or you don’t. There are all sorts of tricks and measuring devices out there that can help the proportionally challenged but like all things, practice certainly wouldn’t hurt. Getting the scale and proportion right takes time and effort. Maybe, if you were Vitruvius, you would just know what to do, but for the rest of us, we need to practice and measure as we go. When you get it right, the end results typically disguise the amount of effort it took to get to the final result. Despite the fact that this clean and simple gable not-a-real-vent detail doesn’t look like much, it has a very important job – a job that I doubt very few people will ever notice … unless I got it wrong.